In-town aesthetically pleasing custom home on .6 private acres. 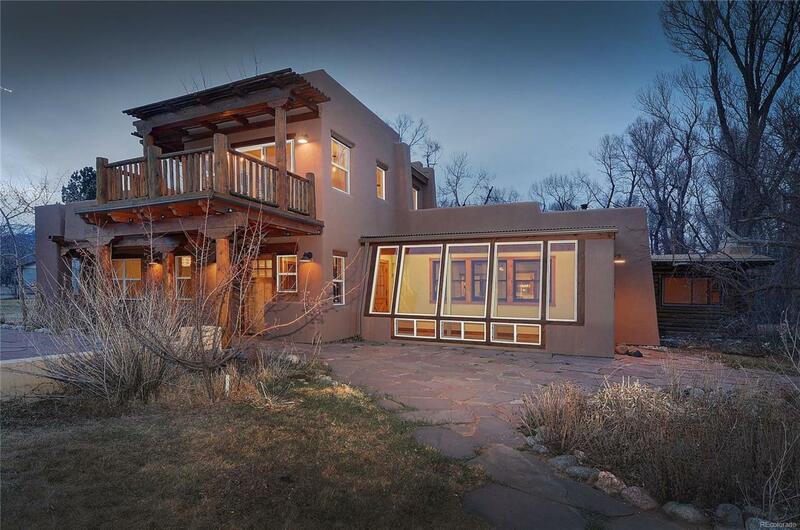 2014 addition/remodel features: hand troweled double thickness exterior stucco walls with curved adobe look, ponderosa posts, wooden window headers and southwest style latillas; circular foyer staircase to loft studio w/southwest facing deck; bath with reclaimed barnwood door/antique rail. 2017 kitchen remodel to install granite countertops accented with Mexican tile and hickory faced cabinets. Master bedroom w/vaulted ceiling, exposed t&g pine beams, sitting area, ensuite master bath with custom vanity, Mexican ceramic sink and cedar sauna. 2 of the 3 additional bedrooms w/private baths. Artistic features include Bernard Maybecks craftsman style doors reclaimed from Principia College and antique built in dining room hutch. Oak, cork, bamboo, tile and stained concrete flooring. Attached green house for plants/passive solar gain. Perennial gardens plus variety of trees. Flagstone path/patio with stucco/firebrick oven.